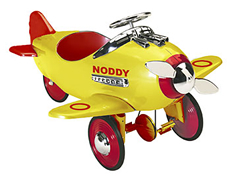 There is just something almost magical about the Noddy pedal cars that is impossible to explain. Maybe it's the memories they invoke of our more youthful days. Maybe it's the yearning for simpler times. Whatever it is, that time is available once again with this range of pedal cars. 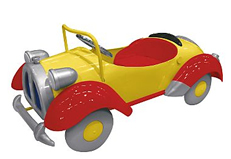 This wonderful Noddy pedal car will be a delight for your child. Made from tough steel, this pedal car will last for generations. Let your kids cruise in this unique original licenced Noddy pedal car. Lead free powder coated paint, all steel construction, padded seat, black metal steering wheel, spare wheel mounted on tailgate, three position adjustable push pedals that will allow child’s growth. Finished in Noddy's bright red and yellow colours. This Noddy pedal car is really superb. The picture is not enough to truly emphasise the quality of this product. Built under licence this car has been strictly designed in close conjunction with the original t.v.character. 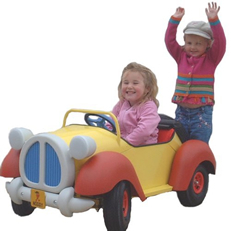 Our Noddy car is a brand new, full sized, UK designed and built pedal car that will last longer and grow with your child. A true representation of Noddy's car, it is made from a steel chassis and rust free aluminium body, finished with a fade resistant powder coat painted for a durable finish and long life. To our knowledge, Noddy is bigger than ANY other production pedal car in the market place and is built to a standard that exceeds the norm!